1. My mother-in-law arrived yesterday for an almost-one-month stay ( 25 days exactly, but who's counting). 2. I finished Gilmore Girls. So.many.emotions. Most powerful of all: A profound feeling of loss. What will I do with all my newly-free time now? I miss them already. 3. We just finished the 5th season of Downton Abbey (we borrowed the DVD from our friends). Once again: So.many.emotions. I don't want to give anything away, so I won't. Just one thing: I cried. I'm also PMS'ing, so there's that, but I'm almost certain I would have cried without the hormones as well. I'm a huge Downton Abbey fan. 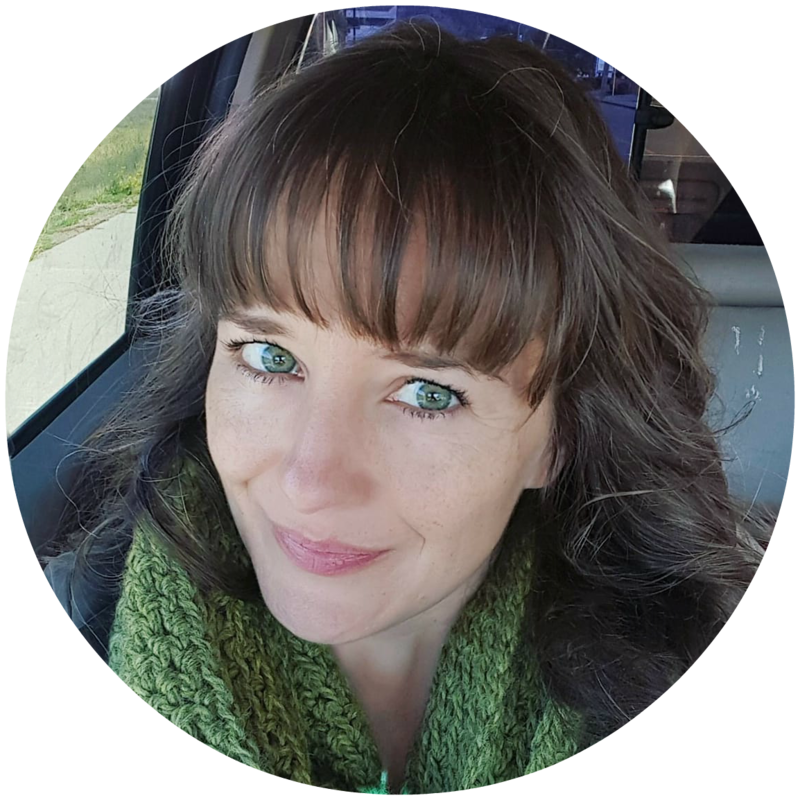 The characters, the setting, the story - it's all so good! 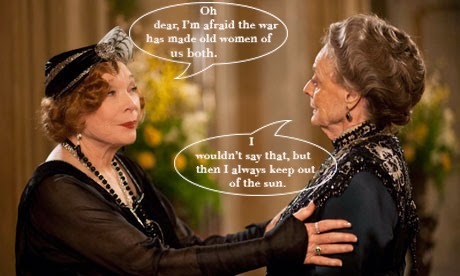 I'm not quite ready to say goodbye yet, so I decided to share some of Lady Grantham's best quotes today. She's the queen of subtle, yet biting comments, and is one of the main reasons that make this show as awesome as it is - if you have watched the show, you know what I mean, and if you haven't - I pity you. Also: Start watching asap! 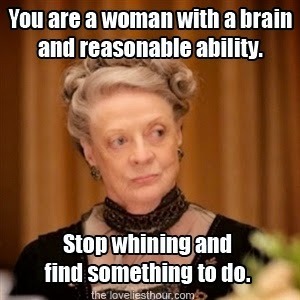 Lady Grantham to Mrs. Crawley: "You are quite wonderful the way you see room for improvement wherever you look. I never knew such reforming zeal." Lady Grantham: "I must have said it wrong." Mrs. Crawley: "How you hate to be wrong." Lady Grantham: "I wouldn't know. I'm not familiar with the sensation." "If I were to search for logic, I would not look for it among the English upper class." "Don't be defeatist dear, it's very middle class." "All this endless thinking, it's very overrated. I blame the war, before 1914 nobody thought of anything at all." "My dear, a lack of compassion can be as vulgar as an excess of tears." Are there any other quotes you love? Can't wait for season 6!! 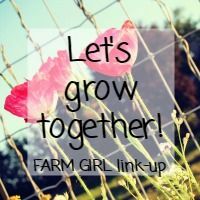 And now, let's link up! Personally I'm a fan of ANY of her quotes....as professor McGonagall :D Haha And wow you finished Gilmore Girls this week, too? I've been watching the seasons in my dorm room and I just finished a couple of days ago! I always get to the end of season 7 and I wish it kept going. What happens to Rory? Do Luke and Lorelai get married? What becomes of Paul Enka!? And Jess? And Logan? AH! So many unanswered questions!!! O goodness good luck with your mother in law, mine is coming in June for like 2 nights and I am already dreading it. Mine came over from Germany, that's why she's staying for so long. We are going to the big island of Hawaii next week, so that should break it up nicely! Palm trees make everything better. I KNOW! Will Rory and Logan ever get back together? Or is Jess the man for her? I don't know how I feel about her choosing her career over love - is it being strong? A mistake? Will she regret it? WHY DID IT HAVE TO END??? Confession: I haven't watched Downton Abbey. I will. I promise - it's on my to-watch list. My thoughts on GG is that Rory ultimately ends up with Jess. Because he has grown up a bit there at the end. They'll circle back to one another. Such good quotes! Maybe I'll have to give that show a try- TV shows > movies, any day. Me, too! I don't know why that is, but TV shows are so much easier to watch. Maybe because they are shorter than a movie? I highly recommend Downton Abbey, it's such a good show! It has that wonderful witty British sense of humour, and a great story line. Yes, I have thought about that too. It's weird, I was so determined to dislike Logan, but he managed to not only win Rory's heart, but mine as well. I was shocked when they broke up! How could they just leave us hanging like this? I want to know what happens next! Very upsetting. Anyway, give Downton a shot, I guarantee you won't regret it. 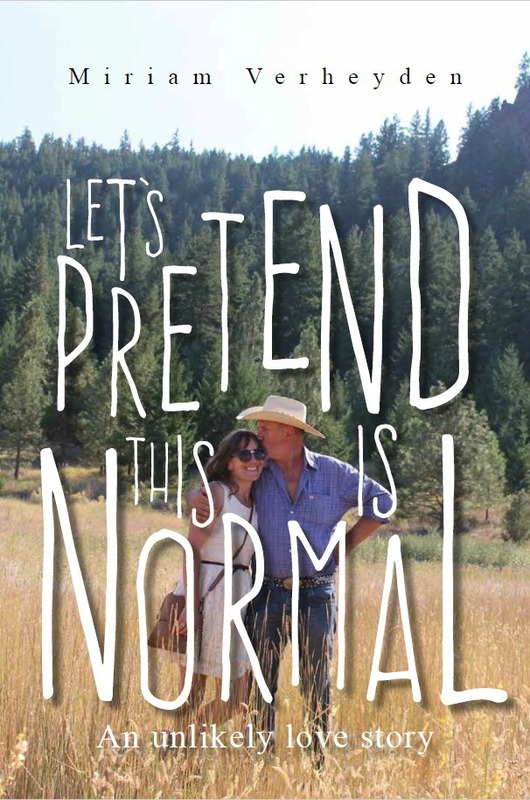 It's funny, uplifting, tragic, and it will make you laugh and cry equally. 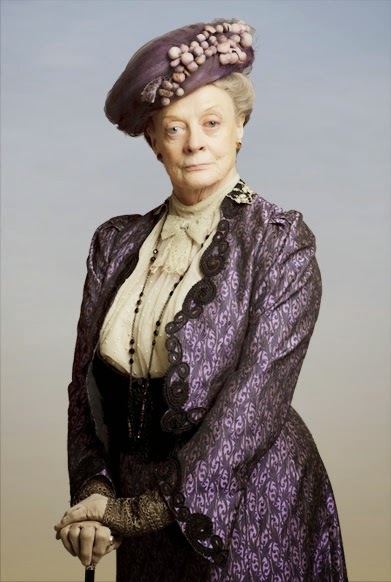 Plus, it has Professor McGonagall in it, and Maggie Smith is just as good (maybe even better?) in her role as Lady Violet than she was as a witch. Watch it! This post was fun and funny and unique. Thanks for sharing. =) I linked up a day late, but still! Have a wonderful weekend as well!